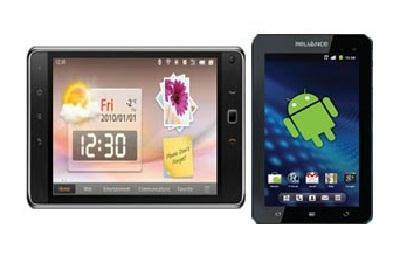 Comparison of Reliance 3G Android Tablet and Bharati Beetel MagiQ with specification and price in India is added here. Read this article to know about cheapest 3G Android tablet in India. It is Reliance 3G tab tablet and Beetal magiQ tablet which has tough competition in India market. If we compare Reliance 3G Android tablet vs. Beetal MagiQ tablet then we get many comparative differences among them. Reliance 3G tab Tablet makes use of Android 2.3 operating system whereas Beetal MagiQ tablet uses 2.2 Android operating system. An important point that should be mentioned most necessarily is that among both versions, it is Reliance ZTE tablet, which has upgrade capability at regular time interval while on other hand Beetal has chosen its own design and there is no option to upgrade Android 2.2 to Android 2.3. Result- It is Reliance 3G tab tablet which wins in this comparison. Both of these tablets have good screen resolution and have a size of 7 inch WVGA screen. When we compare their touch then it is Reliance 3G capacitive screen that makes it impressive because of its full screen capacitive touch which is far better than Beetal resistive display. Beetal has implemented track pad and additional buttons for receiving and rejecting calls. This difference in touch technology makes them different touch screen display such that capacitive screen offers better multi-touch interface to obtain zoom performance and lesser changes of getting faulty errors. Reliance 3G tab tablet has 800 MHz processor but Beetal MagiQ has higher processing capability of 1 GHz processor. Performing any action will take more time in Reliance 3G tab tablet in comparison with Beetal tablet but time difference between them is minor. Some experts neglected this minor time delay. Result- Beetel MagiQ tablet wins the processing comparison. Reliance 3G tab tablet uses 3400 mAh battery while Beetel uses 2200 mAh battery. When we compare battery life of both tablets then Reliance 3G tablet has 3 times better backup life. Result- Reliance 3G tab tablet has better life and hence it wins in battery comparison. When talking about features then Beetal has 8 GB internal memory, external memory expandable to 16 GB and has front and rear camera of 2 megapixels which allows users to watch many videos and brings video calling ability with high resolution whereas Reliance 3G tab tablet has no internal memory but its external memory slot can be expanded up to 32 GB. Reliance 3G camera has 2 megapixel at rear end and VGA camera at front end. For internal memory support in Reliance tablet, a free 4 GB memory card is provided to customers. Result- It is Beetal tablet which has more memory space and high camera at front end. Thus, Beetal wins this comparison. Reliance 3G tab tablet costs Rs 13,000 whereas Beetal MagiQ costs to Rs 10,000. Both companies offer promotional schemes for their customers such that Beetel offers 2 GB 3G data usage for 2 months which costs Rs 1498 whereas reliance offers discounted rate of Rs 151 for 12 months. After multiplying 12*151, we get Rs 1812 which is more than Rs 1498 but reliance SIM card will be locked by the providers and in case you will turn off its lock then you are not provided with warranty rights. Result - It is Beetal tablet which is lesser in price. So, it has strong hand over Reliance 3G tablet. It wins financial comparison. After comparing both tablets, I come to conclusion that both tablets have tough competition but technically Reliance 3G tab tablet is better than Beetal but if you are looking for the cheapest tablet then Beetal tablet should be your first choice. Moreover, Beetel is having more channel traffic as it originated by Bharti Airtel. We also know that Airtel has vast network in comparison to Reliance network.